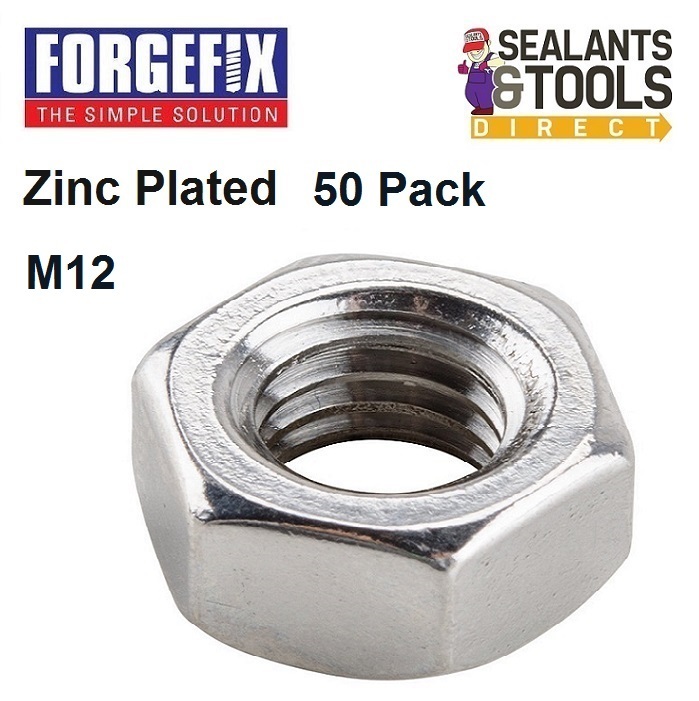 These M12 Forgefix Nuts are made from zinc plated steel, These Hexagon Nuts are bright Zinc Plated for increased corrosion resistance. The hexagonal shape of the nut is designed to be driven by a wrench, spanner or Hex Socket they provide excellent torque. Zinc coatings prevent oxidation of the protected metal to create a longer lasting finish. It does this by forming a barrier and by acting as a sacrificial anode if this barrier is damaged. Zinc oxide is a fine white dust that in contrast to iron oxide does not trigger a breakdown of the substrates surface integrity as it is formed. The zinc oxide, if left intact, can act as a barrier to further oxidation, in a way similar to the protection afforded to aluminum and stainless steels by their oxide layers.